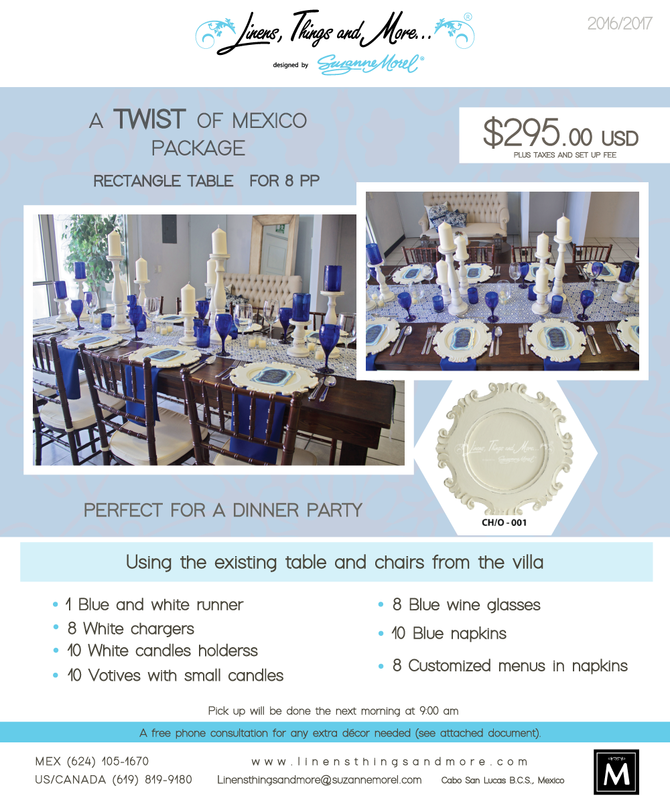 You’ve seen our fabulous custom décor for rehearsal dinners, weddings, birthdays, anniversaries and other celebrations in Los Cabos. 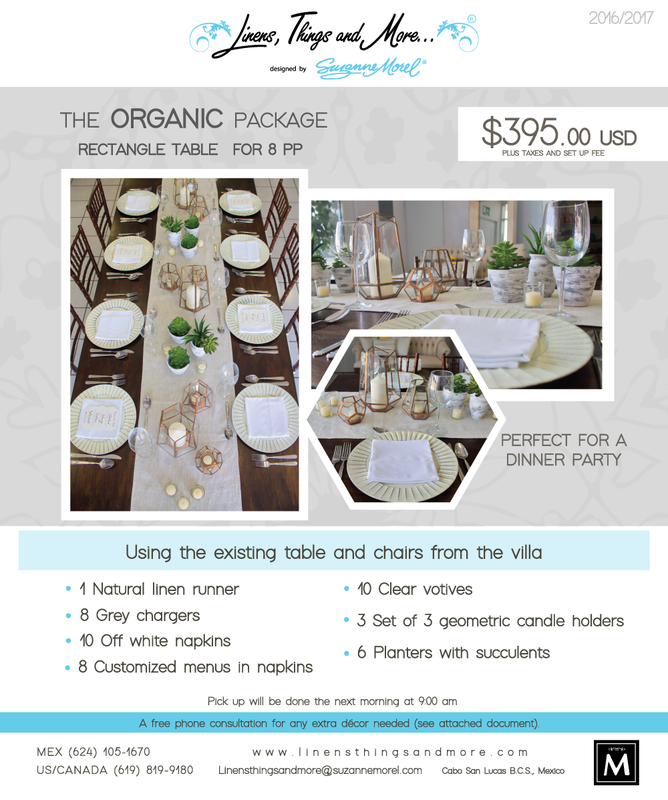 The team of décor designers at Linens, Things and More… is pleased to announce our newest offering: Custom dinner party décor packages—the perfect décor solution for dinner parties in your villa! 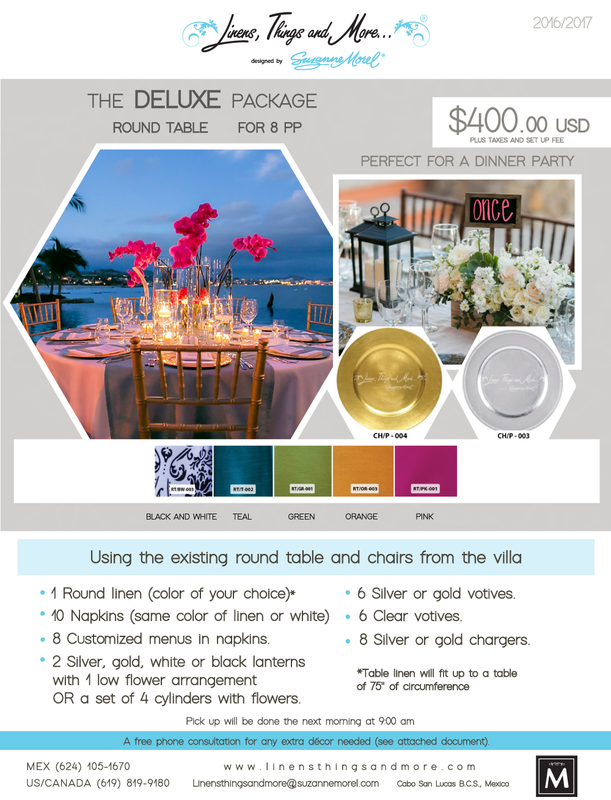 With our new dinner party packages, you can choose a custom décor theme for your in-villa celebration, and we will deliver and set up your party décor for you. We’ll even return to pick up all our rental items the next morning, so you can entertain your guests without interruption on the evening of your dinner party. 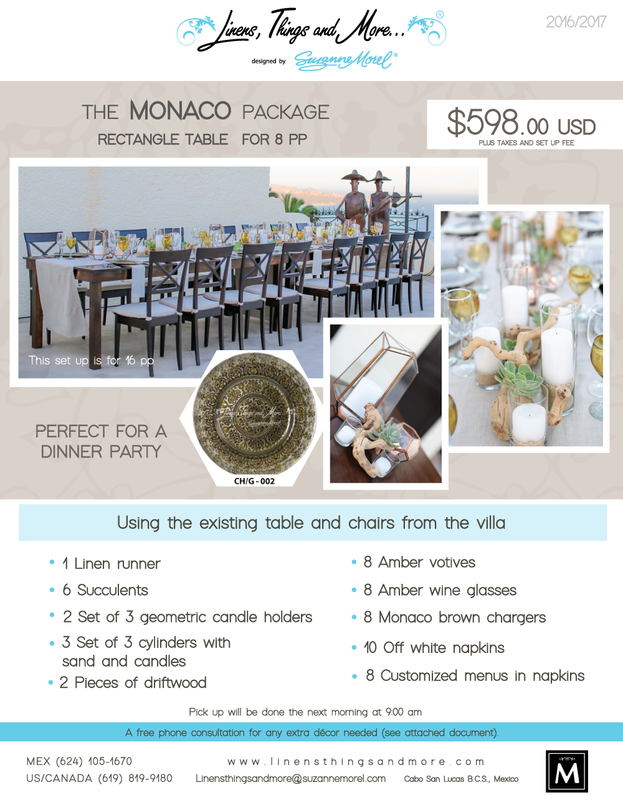 With each unique décor package, we’ll incorporate your villa’s existing table and chairs to create a beautiful, festive table setting for up to 8 guests. 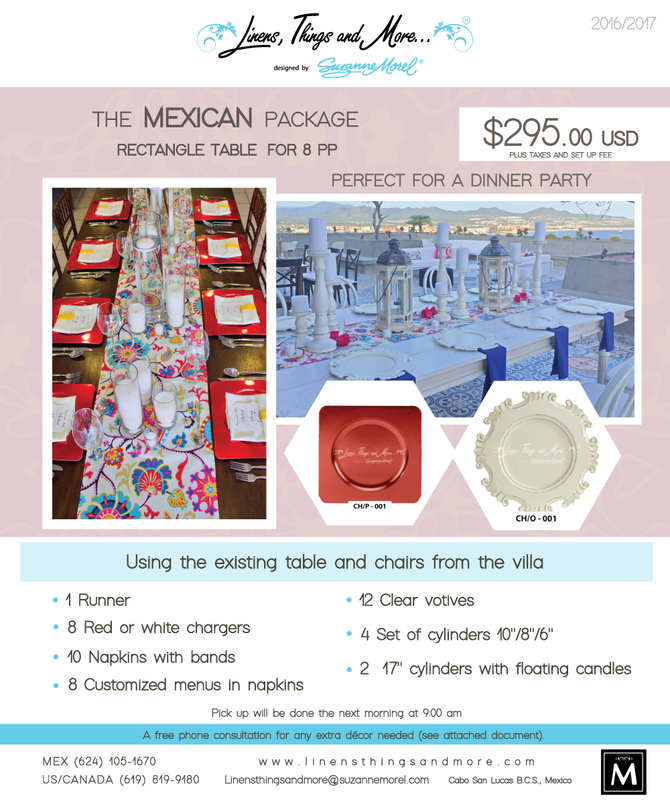 Prices start at $295 USD (plus tax and set-up fee), you will receive one table runner, eight chargers, 10 napkins with napkin bands and your own customized menus inside our perfectly pressed napkins. 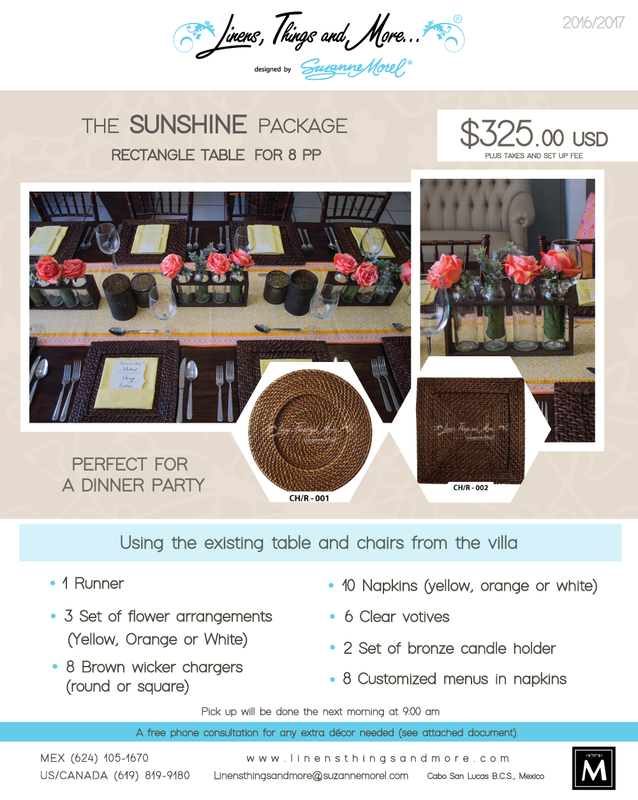 Our special dinner party décor packages also include the appropriate votives, candleholders, succulents and low flower arrangements that combine to create the perfect ambiance for your dinner table (items vary by package). Your guests will love the chic custom table décor, and you will be thrilled at how easy it is to entertain in your home when our team does the decorating! Of course, if you wish to add additional décor items for your in-villa party, our design team is ready to assist you with string lighting, custom bars, catering, speakers, and so much more! Just give us a call at (619) 819-9180 or email us today at linensthingsandmore@suzannemorel.com for a complimentary consultation about your upcoming villa dinner party! This entry was posted in About us, Accessories and decor, Cabo event design and decor, Cabo Wedding planner and coordinator, Cabo Wedding Services, Special Event Decor in Cabo, Wedding Decor in Los Cabos, Wedding flowers Cabo, Wedding Inspiration, wedding locations in Los Cabos and tagged ACCESSORIES AND DECOR, CABO EVENT DESIGN AND DECOR, CABO VILLAS, DINNER IN LOS CABOS, DINNER PARTY, DINNER SPECIALS, LOS CABOS, LOS CABOS RENTAL COMPANY, PACKAGES, SPECIAL RENTALS, WEDDINGS AND CORPORATE EVENTS DECOR TAGS: CORPORATE DINNER PARTY CABO.